Elderslie Estates, which has won a prestigious Scotland's Finest Woods Award, said today it is wholly committed to being in the vanguard of innovation' to realise the tremendous potential of forestry in the future. 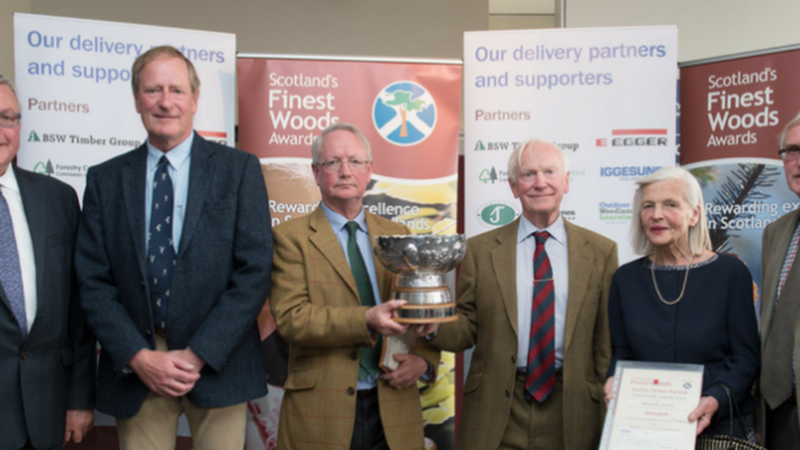 The estate, near Houston, Renfrewshire, has been named joint winner in the Quality Timber Category of the awards and receives the John Kennedy Trophy for multi-purpose woodlands. The judges praised the excellent approach to forestry in evidence at Elderslie Estates. The estate has 400 hectares of woodland on 1,600 hectares of land with three tiers of commercial forestry and woodland. Establishment of eucalyptus species trials in anticipation of fuel biomass production. Monoculture restocking largely abandoned in favour of the intelligent use of mixtures. Public access provision via what was the country's largest community woodland at the time of its planting. Continuous cover, multi-tier forestry management regime within policies. Deer and squirrel populations under proper control, allowing establishment without deer fencing. This award is a terrific tribute to everyone who has been involved in the woods at Houston over the decades, in whatever capacity, but particularly Tim Mack, our forestry manager. In developing our woodlands at Houston we have deliberately pushed boundaries, not only in term of forestry versus agriculture, but also pushed the silvicultural, regulatory and commercial boundaries. We think pushing boundaries is what won us this prestigious award. We are particularly proud of our experimental eucalyptus plantings and delighted to detect a change in attitudes towards this pioneering species and a recognition of its potential role in a multifaceted woodland enterprise. There are enormous possibilities for forestry in the future and our ambition is to stay in the vanguard of innovation. We are living in an era where the old ways in agriculture are fast moving on. The next step is to push alternative silvicultural systems and crops beyond the woodland gate as part of one of the answers to the great conundrum as to how we manage the countryside post Brexit. There is much talk about the replacement for CAP post Brexit, but the proposals tabled all miss the point. They focus too much on agriculture and at the expense of forestry and rural development. When I look at the map of Elderslie Estates and Houston Farms, I don't see a whole lot of distinct boxes, some labelled farming and others forestry or a steading for redevelopment or renewable resource, I see an interwoven and multi layered tapestry. The country now needs a proper "integrated land management regulatory and support structure that also pushes the boundaries. The estate is fully committed to progressive land use and it has been gratifying to work with people who take a collaborative and thoughtful approach to land management.